Vanessa, born in Guadeloupe, spent time in Paris as a model before moving to London and following her passion for cooking. Since 2012 her pop up clubs and private cooking lessons have grown in popularity and she made an appearance on ITV’s Mel & Sue earlier in the year. 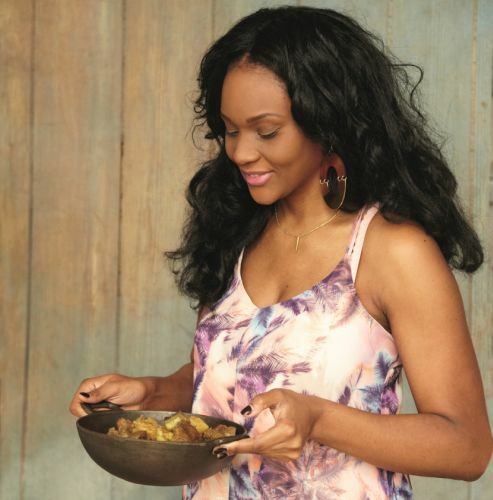 She recently released Creole Kitchen: Sunshine Flavours from the Caribbean, a Caribbean cookbook full of original recipes inspired by her childhood growing up in Guadeloupe and Martinique. itzcaribbean caught up with her for a quick chat to talk about the book and to tell us more about Creole Cooking. Initially you were a model before working with food. How and why did you make this change? I was scouted as a model back when I lived in Paris. It was never in my plan, so it always was something I did alongside studying. It was never my priority but I was lucky enough to have a successful modelling career while deciding on my professional career path. I gradually stopped modelling when I graduated from my MA and started working in Publishing and Marketing. I have been a contractor most of my professional career so it allowed me to carry on modelling for a while until I transitioned was more established into my work as a digital producer. What gave you the idea to write a cookbook? I always liked to read and write. I have been writing since I was eight – a lot of poetry, a lot of drama too. Writing is another passion of mine so when I started experimenting with the food industry and getting involved in it as a potential career, I started documenting things as I explored and discovered them. I have piles of notebooks I can’t seem to get rid of with ideas, notes, stories and recipes. Tell us about your family, how have they influenced your cooking? I come from a family of “bon vivant”. We like stuff that looks good, tastes good and feels good. On Sundays, we could spend hours in the kitchen – chatting and sharing – then even more hours around the table. That’s when aunties give marital advice, uncles make inappropriate jokes, and parents shared stories of growing up. We’d be loud, laughing, eating more, drinking, move to the terrace, have more food like cakes and flans, more relatives would show up, then you’d open another bottle of something etc… Life happened around food. Do you have a favourite recipe from Creole Kitchen, or one that you are most proud of? It’s hard to choose one recipe. The one I’m the most proud of is the peanut cake or “gateau pistache”. It’s funny because to this day I confuse the word pistachio for peanut, because back home we use the word pistachio to describe peanuts. I digress. This cake is so unique. I was very hard on myself when I developed the recipe, especially because I was trying to achieve the authentic taste of it. This cake is from Marie- Galante, which is a tiny island in the Guadeloupe archipelago, which my mother hails from. There’s only one woman that used to make this cake and since we lived on the main island, we had to order it for special occasions, it would be placed on a boat, would travel to the port, we’d pick it up and when you go through such a hard time to get the cake, you appreciate every slice. Even my mum can’t do this cake. The lady we used to order it from has died, but I think there’s a man that now does it and took over her clientele. I haven’t tasted his yet, but my cousins tell me it’s not the same. So I created my recipe. After many failed attempts, the recipe that’s in Creole Kitchen is what I believe the closest you could get to the original Marie-Galante Peanut Cake. What are the basic differences between French Caribbean Cooking and cuisine from other islands? I think the French influence; especially in the dessert area can strongly be felt. The array of dessert we boast in French Caribbean cuisine is really what differentiates us from the other islands. Obviously in a larger sense, we use the same ingredients as the other islands and a lot of the recipes do crossover and are pan-Caribbean. However, for instance “gratins” are pretty big in our cooking. We do gratins with everything, ground provision, fruits, vegetables, pretty much everything. We do use a lot of butter, cream and cheese in our food, which again is all about the French impact on our food. Our fish or seafood dishes are often all about poaching, and our flagship dish is court-bouillon which sets the tone pretty quickly. But beyond that I do believe that, similarly to the other Caribbean island, the food is all about how the different migrations occurred on our different islands and who settled at which point. We had a lot of Congo slaves in Martinique and Guadeloupe, so that influence can also be felt in the slow-cooked stews we have. Do you think being a great chef is a natural talent, or something anyone can achieve? Being a chef is about a set of skills; certain flair and a passion for people. You cook for people; you try to make people happy through a culinary experience. I’m not personally a chef, but merely a greedy home cook that happens to know how to communicate her experience with food she grew up with. I admire chefs, it’s not an easy profession but I’m sure anyone who has a real passion for it can do it. Do you have any top tips for first timers trying out your recipes? Just go with the flow. If something doesn’t feel right, switch. If you can’t find an ingredient, substitute. Don’t stress and have fun with it. I have a cool YouTube playlist I blast in my kitchen when I’m cooking, if you can’t be bothered to create one, use mine and get loose in the kitchen, there are no real rules with my food, just be free. What are your 3 favourite ingredients, the flavours you couldn’t live without? Lime, hot pepper (habanero or scotch bonnet) and garlic. I don’t have any, I like all foods but plain rice bores me and chicken is my least favourite meat. What trends are you seeing in Caribbean cuisine at the moment? Chefs are currently doing a great job at modernising Caribbean food and make it look good. Our dishes aren’t the prettiest in their authentic form but I see a lot of effort in creating even more fusion, giving Caribbean food a gastronomic edge and I think it’s working. I see people like Marcel Ravin at the Blue Bay in Monaco doing great things with local, seasonal ingredients allied to his Caribbean roots, or chef Jason Howard making each plate a work of art so there’s definitely something happening with our food in that respect. Do you have a favourite dish that you enjoy cooking at home? I love my Creole Cassoulet, it takes ages but I can eat it for days after that! Is there anyone in particular you would like to cook for? 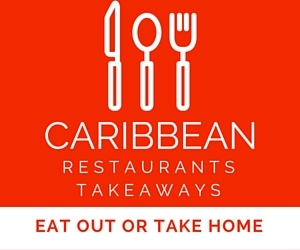 Do you have a favourite Caribbean Restaurant or takeaway in London? I love the bokits from the Bokit La boys, which you can find 4 days a week across London, I also do love Boom Burger in Portobello Road. You also run creole cooking courses tell us more about that? Can people sign up to learn how to cook your recipes in London? Yes, I teach small groups now, between two and three people at the time, either in their kitchen or my own. It’s not your prestigious cookery class in a fancy kitchen with tons of gadgets and equipment. It’s a hands-on session when I’m your cooking buddy and you learn simple recipes in a kitchen like yours. It’s something that just happened. I took a few friends with me to Guadeloupe and realise I not only learned but had a lot to share and show. Then I have people that have been to my classes, came to the supper club, then the pop-ups and now, after hearing all they heard and sampling all I made, they want the real deal. So I’m offering that to them. What surprised me was that from that attempt to make a group trip, a lot of people have booked me separately to take them on private tours with themes they fancied a bit more. So although the culinary is still in the backdrop they want to learn more about the local fashion, beauty products, artisan producers or history and literature. I’m reaching the goal I set out from the beginning, slowly and steadily, to get people interested in my islands as a whole by hooking them through the food. That’s a dream of mine. Where next for you, do you have any plans for 2016? Next I have RumFest coming up and I’m so excited to be demo’ing there on the 17th October. I also have my different tours throughout November until mid-December. I’ll also be busy planning my Christmas Hampers, full of Creole goodies. Creole Kitchen will release in a number of countries in the new year, so I hope to visit them all to promote the book. I also really want to run a few more tours in 2016 and travel across the rest of the Caribbean to visit all the food festivals.